Patience McDonough's plans for a perfect summer at Verity College get off to a rocky start and go downhill from there. She turned down full scholarships to Ivy League colleges because of a decision she made as a child. She's dismayed not only at the emphasis on the sports program, but also on her grandfather's obsession with getting rid of the college president. Her work assignment turns into a nightmare as strange happenings crowd her days. Although her name is, "Patience," she struggles to exhibit that trait. Yet, it's evident she desires to do the right thing and please God. Will her lack of patience be her downfall or will mercy and grace pull her out of a truly scary situation? 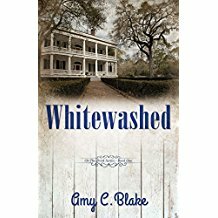 Amy C. Blake is a new-to-me author. The book started off a bit slow for me but soon picked up the pace. The unfolding mystery and potential love interest kept me engaged. A few red herrings made me wonder if I had the right villains nailed. She pulled off an exciting climax and a satisfying ending. This book is suitable for the YA crowd, as well as adults. I'm giving Whitewashed 5 Stars for story content and 4 for execution. Disclaimer: I received this book as part of a free promotion on Amazon. Neither the author nor the publisher gave this reviewer any remuneration for a favorable score. All opinions expressed, as always, are mine and mine alone. Writers: Have you ever focused on a character's struggle with a negative trait such as impatience? Please share. Readers: Have you read any YA (young adult) books? Do they interest you or do you find them too simple for your tastes? Hi Karen - Thanks for stopping by and commenting. I've been reading some excellent books lately and wanted to share them with my blog readers. God bless!